If there's one simple thing you can do to greatly benefit your health, it's to schedule a dental cleaning every six months. The health of your teeth and gums affect more than you may think, and regular checkups including thorough cleanings go a long way to help catch dental health problems and avoid more serious issues down the road. What Do We Do During a Dental Cleaning? When we clean your teeth at Newman Family Dentistry, we're doing a lot more than you can do with a tooth brush and floss. Our goal is to remove bacteria harboring plaque and tarter that have accumulated on the teeth - especially in hard to reach areas. Even if you routinely brush and floss, tarter can still build up where you may not see it. A professional cleaning is a crucial part of good oral health and is needed periodically to maintain the health of your gums and teeth. We recommend having this done every six month to reduce the chance of periodontal disease and cavities. A cleaning generally goes along with a thorough exam and x-ray to look for signs of cavities or gum disease. First your dentist will ask if there are any recent problems and thoroughly exam the surface of your teeth and the health of your gums. After this the dentist will use a tool to remove plaque and tarter, and then polish your teeth with a special paste. We'll carefully floss between each tooth and make sure to answer any questions you might have for proper brushing and flossing. After your cleaning, your mouth should feel fresh, clean, and disencumbered by months of tartar build-up. Good oral hygiene is the best way to prevent bad breath. Even if you floss and brush regularly, a dental cleaning goes after places where bacteria love to hide. This is how we can help keep your mouth odor-free. Drinking liquids like wine, tea, or coffee and using tobacco can create dark stains on your teeth. But a dental cleaning can remove built-up stains, and leave you with brighter, polished teeth. Studies have shown a connection between the health of your teeth and your overall health. Regular cleanings that remove bacteria and prevent infection may also help lower your risk for some diseases like heart disease and stroke. There are many medical conditions that can be detected in their early stages by your dentist during your routine exam. Plaque is the yellowish film that can build up on your teeth between brushing and it's the leading cause of tooth decay. This acidic substance eats away at your tooth's enamel and lead to cavities. But this can be easily removed by proper brushing, flossing, and routine preventive dentistry. Built-up plaque and tartar give quarter to bacteria that cause gum disease. This in turn is a major cause of tooth loss in adults. As gum disease advances, bacteria travel down the tooth where it destroys the supporting bone in your jaw. Without this support, your teeth can eventually fall out. Fortunately, the chance of this happening can be significantly reduced through regular cleanings and good oral hygiene. And lastly, good oral hygiene with regular cleanings can save you money in the long run. The copay for a cleaning is much less expensive than more invasive procedures that may have been prevented with these healthy habits. With routine cleanings you can potentially avoid cativies needing fillings, gum disease treatments, tooth aches, and eventually dentures. 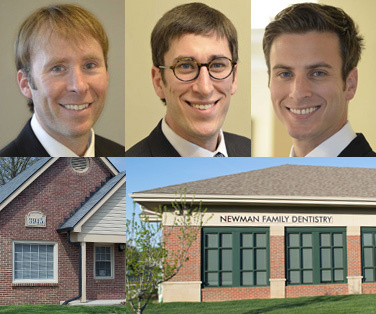 If it's been a while since your last dental cleaning, the dentists at Newman Family Dentistry will be happy to see you and help you prevent your can answer your questions and tend to all of your dental needs. Please don't hesitate to contact us and we'll set you up with an appointment. We have openings at both our locations in Carmel and Indianapolis.